A dental bridge is a reliable, commonly used restoration for missing teeth. It functions to ‘bridge’ the gap left by a lost tooth, restoring your smile and oral function. Dental bridges look and feel like your natural teeth. They are also very hardwearing and can last for a number of years. At Broseley Dental Practice, our team has used dental bridges successfully and skilfully for many years. Our laboratory will create a natural looking artificial tooth that will blend into your mouth and function just like your remaining teeth. 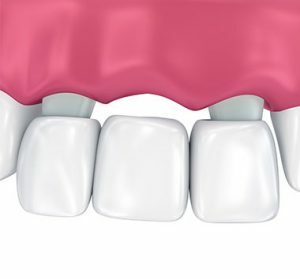 Bridges are supported on either side by your natural teeth which are fitted with crowns. They act like an ‘anchor’ for the bridge to hold it firmly in place. The fitting of a dental bridge takes places over two to three appointments. Your Broseley Dental Practice professional will start by preparing the adjacent teeth for the placement of the crowns. For example, they may need to be reshaped so the crown can be fitted. Once impressions have been taken of your teeth, our laboratory will then make the new false tooth and crowns that will be fitted at your next visit. We use a strong dental adhesive for the crowns so you don’t need to worry about them moving out of place or feeling loose. We offer different types of dental bridges and will discuss the best option for you.